Lime & Lemon Syngonium is a beautiful plant from the family of Araceae. They are woody vines and grow foliage, which changes shape according to the growth of the plant. They are great houseplants with does not require much maintenance. 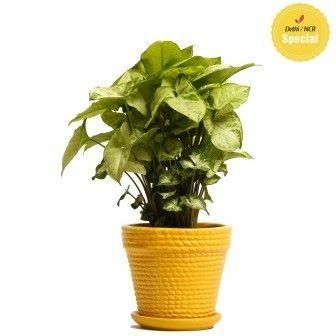 It is placed in a finely crafted yellow colored pot, which is with two specially ventilated layers, which keeps both the planter and the plant safe.